My patients with hypothyroidism keep asking about stories they’ve heard in the news or seen on-line about the effects of certain foods on their thyroid health. This article hopes to separate fact from fiction with a sprinkling of common sense rather than all or nothing. To enlarge graphic below click on photo. Yes, foods containing goitrogens, compounds that make it more difficult for the thyroid gland to create its hormones are not advised with thyroid dysfunction. However, reports that tell you to completely avoid foods that can be healthy are prophesizing the all or nothing approach, which in my experience is not well placed. What is not often mentioned in the cautionary mention about avoiding foods containing goitrogens is that you can prepare those same foods by simply lightly steaming your vegetables before eating them and still have your “cake” and eat it too. Steaming significantly, or completely, reduces the amount of goitrogens. Soy is the most common concern, but broccoli, peanuts, strawberries, kale, and other vegetables are also on most avoid lists. Don’t buy into the messages that if you have any kind of thyroid issues you must avoid these foods altogether. Know the facts before you decide to remove healthy, nutritious foods when it’s not necessary. As many of you know, we offer TeleClasses for Rejuvenation Detox several times a year to assist you in getting well and staying well while aging without looking or feeling old, naturally. The timing of this next series is perfect to get your body in shape before the holidays and all that rich, sugar-laden food and other temptations. Keep in mind that once you participate in one of these classes you can retake the entire series (6) up to 3 times more within a year whenever it's offered at no charge so that you can continue to reduce your body's overall toxic burden. 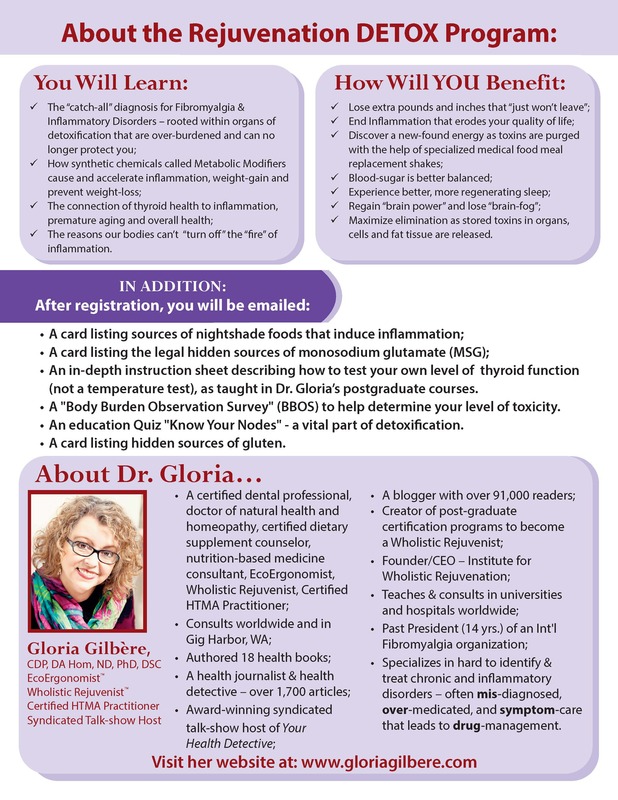 As requested by participants for the past three years, 3 classes are interactive online so you can see my screen and presentation, 3 are emails you send me directly in order to receive more individualized guidance for the program for your specific health needs. This in no way constitutes a consultation as a client but rather to guide you in following the detoxification guidelines as outlined in my presentation and in the book that is included, as well as educational material you'll receive once you register.